Understanding significant differences in growth trajectories and living standards across countries is a critical endeavour for development research. Massive changes in economic growth are common in developing countries, with most having experienced distinct episodes of growth acceleration, deceleration and/or collapse, leading to staggering income gains and losses over relatively short periods. The new conceptual framework presented here moves beyond a focus on ‘what’ policies and institutions are conducive to inclusive growth, towards analysis of ‘how’ political processes shape the emergence and maintenance of these policies and institutions. 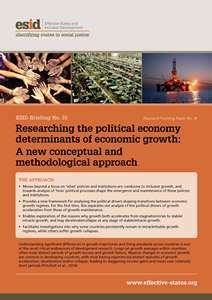 It separates out analysis of the political drivers of growth acceleration from those of growth maintenance. It finds that growth acceleration is explained by the emergence of repeated personalised relationships between political and economic elites. This framework facilitates investigations into why some countries persistently remain in miracle/stable growth regimes, while others suffer growth collapses.